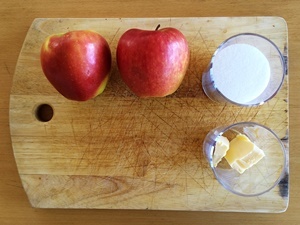 Here’s another easy, quick and delicious apple dessert recipe. This simple, old-fashioned apple crumble recipe (without oats) from my grandma creates comfort food at its very best. 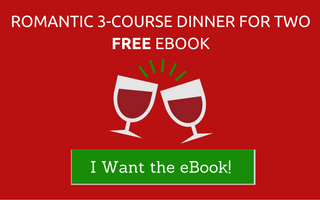 This, in my eyes, is an essential recipe for every amateur chef. It makes my mouth water just thinking about it. I’m no Jamie Oliver but I’m sure that Grandma Pinoit’s delectable apple crumble topping recipe will leave you asking for more. 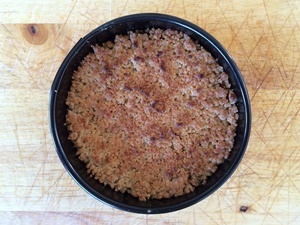 Read on to learn how to make an appetizing apple crumble topping in 30 minutes, the French way! 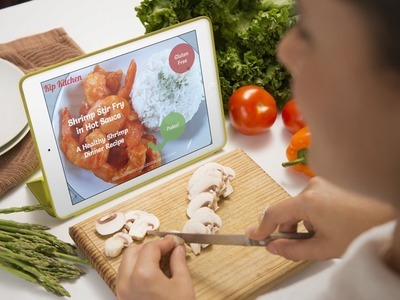 Switch your oven on and set it to 200ºC (400F). Peel your apples, cut them into 4. Cut away the parts with the seeds and then cut every piece into smaller cubes. Leave them aside for now. 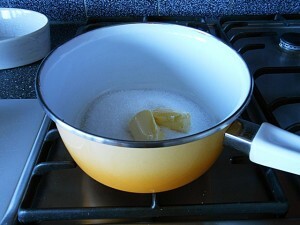 Put the butter and sugar into the saucepan. Turn the stove to high fire and mix constantly. At the beginning you’ll get a weird yellowish mix but it will turn very soon into a nice brown caramel. Turn off the fire as soon as it’s uniformly brown. Don’t wait until too many bubbles appear, it would mean that your caramel is burning. Be careful, the caramel is very hot now! 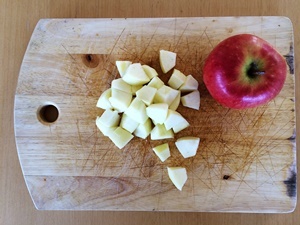 Put the apples cubes in your oven dish. 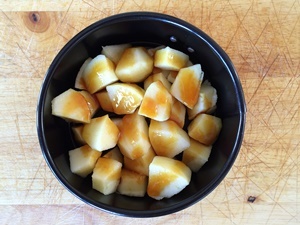 Pour the caramel over the apple cubes and put the dish into the oven for about 10 minutes. 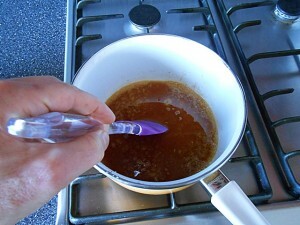 A small tip here: the caramel “solidifies” when it cools down so washing it off the saucepan might be difficult. To avoid that, after pouring the caramel on the apples, let the saucepan cool down a bit and then fill the saucepan with hot water and a drop of dish soap. Leave it for 10 minutes and it’ll be easy to wash it. 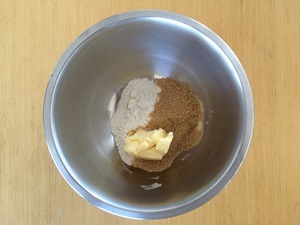 Put the flour, cane sugar, butter and hazelnut butter into a mixing bowl. 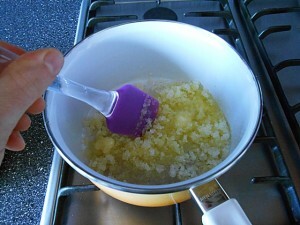 Mix the ingredients – I use my fingers even if it’s a bit sticky as I get a better result. What you aim at getting is a kind of grainy mix. 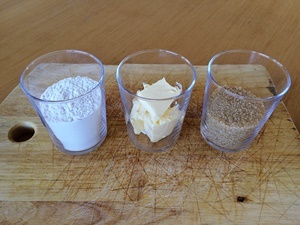 Mix it with your hands! 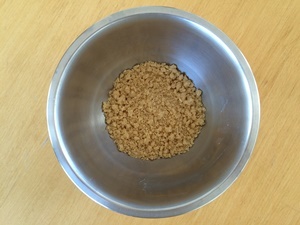 When the apple-caramel mix is baked, remove the dish from the oven. Add the grainy crumble mix (the one that left your fingers sticky just now) on top of the apples and put the dish into the oven for another 10 minutes. 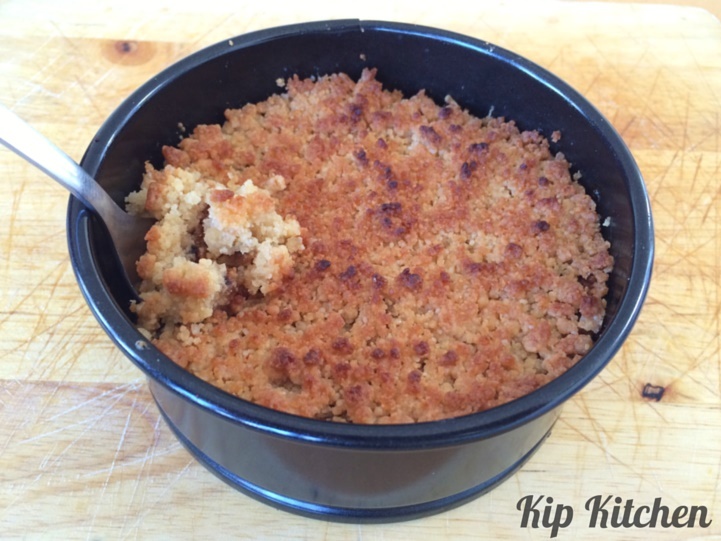 Just let the apple crumble cool down for a few minutes, and then you can devour it! I recommend you eat it warm. Which means that early spring, like now, is a perfect time to cook this classic and yummy dessert. In the middle of a hot summer you might want to have it cold–no problem, you can keep it in the fridge for a day or two. If you do so, take it out and leave it at room temperature for 15 minutes before eating. 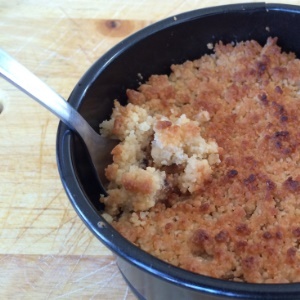 Is this the best apple crumble recipe you’ve tried? 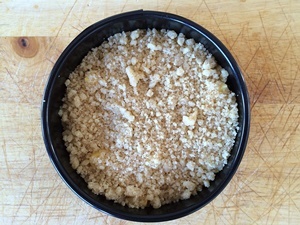 Would you like to see an apple crumble youtube video? Leave us a comment below!